"The fifteen Canonical Orthodox Churches, numbering some 300 million Orthodox Christians, sent their representatives to Thessaloniki to meet with each other between April 29th and May 2nd in order to deal with a new Old Calendar heresy. This new phenomenon of Anti-Ecumenical Augustinians are headed in Greece by the so-called Orthodox Metropolitan Cyprian of Fili and in the U.S.A by the so-called Orthodox Archbishop Chrysostom of Aetna, California. They have been caught trying to establish their Augustinian heresy posing as enemies of Ecumenism in such countries like Russia, Bulgaria, Serbia, Georgia etc. This Cyprian of Fili had originally been a new calendar priest of the official Church of Greece. But some years ago he joined an Old Calendar Church. It is suspected that behind this movement are those who are trying to penetrate Orthodox countries with Augustine's heresies under the guise of Traditional Old Calendar Anti-Ecumenical Orthodoxy. Posing as very super-conservative traditional Orthodox, Cyprian of Fili and Chrysostomos of Aetna have been quite busy trying to promote and defend Augustine's heresies among the Orthodox as one can readily see in their publications. What is of interest is the fact that both Latins and Protestants consider Augustine as the founding father of both the Latin and Protestant theologies. Therefore, what is said in this introduction about the cure of the sickness of religion applies equally to both Cyprian of Fili and Chrysostomos of Aetna and their attempt at penetrating traditional Orthodox countries with the sickness of religion." What does Fr. Romanides mean when he calls the group of Metropolitan Cyprian and Archbishop Chrysostom "Anti-Ecumenical Augustinians"? We must add to this however that the First Canon of St. Basil suggests that the issue of schism and heresy is more complex than is implied by St. Cyprian. Though the Orthodox Church agrees with the ecclesiology of St. Cyprian, it also acknowledges the oikonomia applied by St. Basil. Through oikonomia, or economy, the Church can create grace where there is no grace, and thus fill the empty form of a sacrament by schismatics and heretics. For this reason, often a schismatic or heretic will be received into the Church through chrismation, and not baptism. This economy applied by St. Basil however does not override the ecclesiology of St. Cyprian, but rather compliments it. Orthodox ecclesiology states that the Church can create grace outside of Her boundaries, but at the same time does not accept what is beyond her boundaries. To be fair to Augustine, however, he did believe that schism and heresy were a serious matter. He wrote: “There is nothing more serious than the sacrilege of schism because there is no just cause for severing the unity of the Church.” The boundary however was spiritual, where grace operated but it did not save. On the other hand, Metropolitan Cyprian and his Synod considers the canonical Churches to be a part of the Church of Christ. He writes: "Persons in error concerning the correct understanding of the faith -- and thereby sinning, but not yet judged by an ecclesiastical court -- are ailing members of the Church" ("Ecclesiological Theses," ch. 1, 4; pp. 2, 7). So he divides his ecclesiology between the "ailing" and the "healthy". His Synod consists of the "healthy" members of the Church, while all those outside of his Synod are "ailing". Though the ailing are "walled-off" from the healthy, they are still part of the Church. He writes: "The New Calendarists, besieged by the heresy of Ecumenism and Innovation, have not been deprived of Grace, or at any rate, it is not within our competency to make such a pronouncement on our part ... we are not speaking of union with Belial, but (only) with those ailing in faith, several of whom are in need of spiritual treatment ... in view of this, we do not totally break off communion with them.” Yet as the ROCOR Church stated in its 2001 Resolution which terminated its communion with Metropolitan Cyprian and his Synod: "Metropolitan Cyprian declares in his thesis that 'the Orthodox have become divided into two parts: those who are ailing in the faith and those who are healthy...' (Ch. 3, p. 4), but then he immediately goes on to speak of 'restoring to Orthodoxy' those ailing in the faith (Ch. 3, p. 5), whereby he clearly falls into a doctrinal contradiction, for how is it possible 'to receive into Orthodoxy' those who already are Orthodox?!" "Without a doubt," says the venerable John Cassian the Roman, "he who does not confess the faith of the Church is outside the Church." The same is confirmed also by Patriarch Jeremias II of Constantinople: "Members of the Church of Christ are wholly devoted to the truth, and those not wholly devoted to the truth are not members of the Church of Christ." And St. Cyprian of Carthage teaches: "Just as the devil is not Christ, although he deceives in His name, so also such a one cannot be accounted a Christian as does not abide in the truth of His Gospel and Faith." In agreement with all the Fathers, the Great Hierarch Gregory the Theologian, in his Second Epistle Against Apollinarius, also teaches: "Avoid those holding to another doctrine and consider them alien to God and to the Universal Church." The "Epistle of the Eastern Patriarchs Concerning the Orthodox Faith" states: "We believe that all among us are members of the catholic Church, even the faithful themselves, i.e., those who unconditionally confess the pure faith of Christ the Savior." And St. Gregory Palamas also explains: "Those who are of the Church of Christ, the same are of the truth; and those who are not of the truth, the same are also not of the Church of Christ." "Metropolitan Cyrpian makes a statement concerning the division of the Church by reason of ecumenism, by drawing an analogy between the present state of the Church and Her state during the time of the iconoclastic heresy. In his ecclesiology, he attempts to compare the present-day new calendarists and ecumenists with the iconoclasts, whom the Fathers of the Seventh Oecumenical Council united to the Church through repentance and the renouncing of their heresy. Likewise, Metropolitan Cyprian refers to the Seventh Oecumenical Council, the Acts of which employ the expressions 'severance,' 'divisions,' etc. He reaches a totally unfounded conclusion, that the iconoclasts, prior to their having been judged by the Council, were not yet heretics, as such; and that their mysteries were therefore recognized as being valid. However, concerning the iconoclasts who were joined to Orthodoxy, neither did the Oecumenical Council consider them as having belonged previously to the Church, nor did they themselves make any pretences as to their comprising Her. Here are the testimonies of the joining iconoclasts themselves. 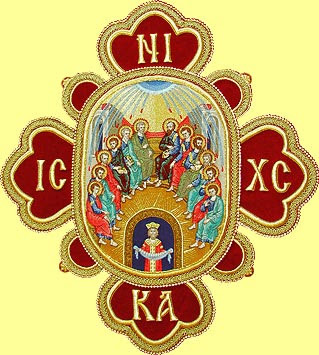 Basil, Bishop of Ancyra: 'To the extent of my ability, I investigated the question of icons, and with complete conviction turned to the Holy Catholic Church.' Theodore, Bishop of Myra in Lycia: '...I pray God and your holiness to join me, a sinner, to the Holy Catholic Church, as well.' John, the most-God-pleasing Locum Tenens of the Apostolic Throne in the East said: 'Heresy separates every man from the Church.' The Holy Council stated: 'that is obvious.' But Metropolitan Cyprian, in his ecclesiology, changes the terminology: 'they were received into Orthodoxy,' thereby inferring an unthinkable distinction between the Church and Orthodoxy, which is impossible." Metropolitan Cyprian cites St. Nikodemos the Hagiorite for inspiring his ecclesiology for "walling-off" the ailing members of the Church from the healthy. However, Fr. Epiphanios Theodoropoulos writes: "The Holy Kollyvades, as opposed to the Protestantized Old Calendarists, did not cut themselves off from ecclesiastical communion with the Latin-minded of their day. In fact, greater grievances took place then against the Holy Canons than those which are committed by today's espousers of Ecumenism. Many witnesses refer to the fact that the Orthodox received Communion from the Papists and vice versa." Fr. Epiphanios goes on to write how their testimonies showed that they liturgized together, prayed together, commemorated their hierarchs, performed their funerals, received their Confessions, and were taught by them. Despite all this, not even the Holy Kollyvades Fathers walled themselves off from the Church, nor was it indicated that they considered to do so. He also writes how when Orthodox even accepted Catholics into communion, as was done in 1274 and 1439, not even then did even the most zealous Orthodox (like St. Mark of Ephesus and St. Gennadios Scholarios) consider establishing their own Church with their own Hierarchy and thus cut themselves off, or divide themselves. Even St. Theodore the Studite and his Synod, whom Old Calendarists bring up as one of their champions, and who was anathematized by many in his day for cutting off communion with the Church for certain economies done by the hierarchs, including St. Methodios who was Patriarch, eventually repented and returned to the Church. Not only did St. Methodios condemn the actions of the Studite Fathers, but St. Daniel the Stylite, St. Ioannikios and St. Theophanes the Confessor did as well. St. Theodore was indeed a champion of the Church against Iconoclasm, but this did not prevent him from committing a serious ecclesiological error which, as stated, he did repent of. So the dilemma of Metropolitan Cyprian and his group is to either cut themselves entirely away from the canonical Church, if they truly believe them to be preaching heresy, or to unite with the canonical Church and cease preaching that the Church is divided. Otherwise they remain in a heretical limbo cut off from the Church.